Recorded Live at Hammersmith Odeon, London, England - January 20, 1981. Ex- Audience Recording :: PRO-CDRs :: Lossless FLAC. Files: 14.:: Size: 608,46 MB (flac). Personnel: Tony Iommi: Guitar / Ronnie James Dio: Vocals / Geezer Butler: Bass / Vinnie Appice: Drums / Geoff Nicholls: Keyboards. Notes: Artwork Included (but see notes below regarding the order of tracks). The show is well-known, but this bootleg IMHO beats any other version of this show that has been released before (and possibly any other version in circulation). 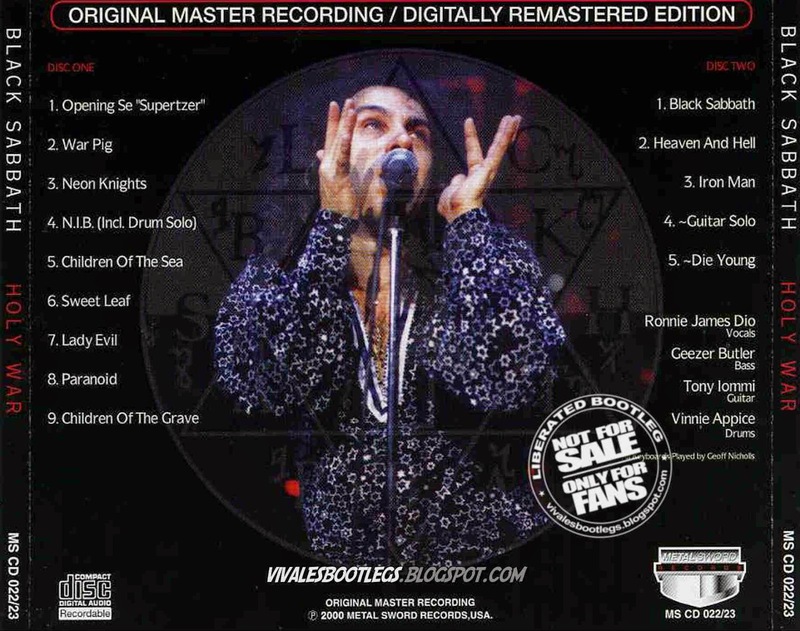 Two sources are available from this show: one was taped by Purplecockney AKA Steve M.; the other (better-sounding) source was released on the 'London Hammersmith Odeon' LP bootleg and also released in several versions (including the 'Never a Maker' and 'Live Murder Act I' CD bootlegs, both of which are obviously sourced from the 'London Hammersmith Odeon' LP bootleg). 'Holy War', which I am uploading here, is from the same source as the 'London Hammersmith Odeon' LP bootleg and its CD reincarnations. 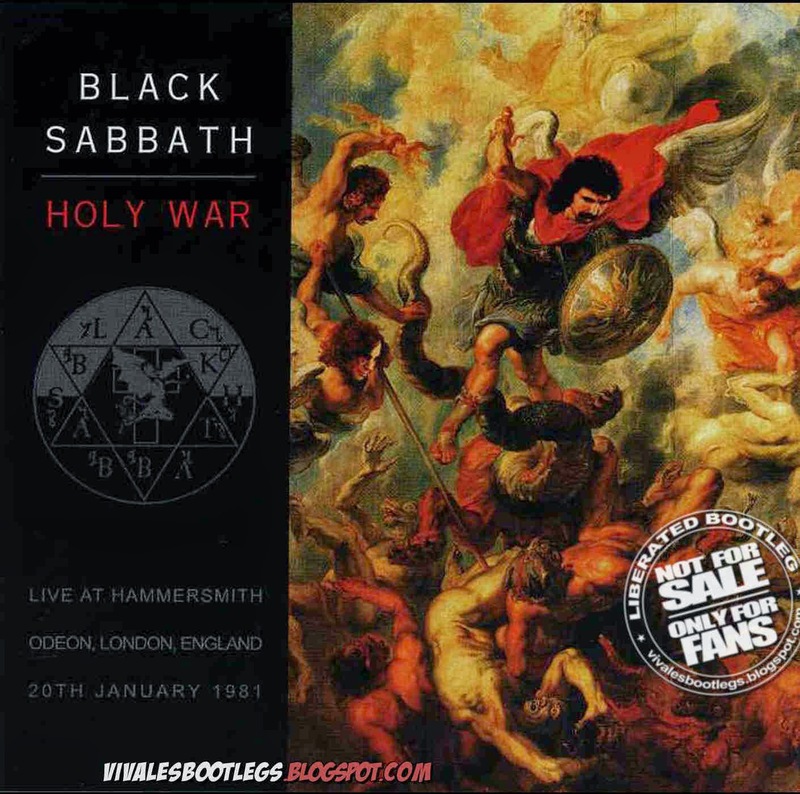 'Holy War' was released by Metal Sword Records in 2000, and the artwork claims that it is a 'digitally remastered edition' of an 'original master recording'. While I am generelly sceptical about claims written on the artwork of commercial bootlegs, I tend to believe that this is really sourced from a transfer of the master tape. Thus, the sound quality is even better than on the other available bootlegs (which are quite nice already), and I do not hear any vinyl cracks. Moreover, the sound is NOT overcompressed (as it is on some commercial CD bootlegs of other shows, especially those released by Tarantura - I am extremely happy that this bootleg is NOT from Tarantura!). A picture of the spectrum is included in this upload. More importantly, check out the samples below - I am curious for your opinions! - and arranged for a smooth transition between 'Die Young', encore break and 'Paranoid'. Many thanks to Phobos for his work! Anyway, for those who prefer to have the tracks in the same order as they were released on CD, I have added the original files of 'Lady Evil', 'Die Young', 'Paranoid' and 'Children of the Grave' in a subfolder of this upload, called 'Original tracks'. (Info taken from original info file).